Speaking of enhancements to this version, you're now able to weigh your dog, aren't you? When we originally made Wii Fit, we did have the notion that we'd like to allow users to weigh their pets. My pet dog is a member of my family, after all. But you abandoned that idea, didn't you? Yes, we did. 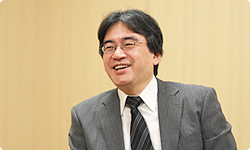 Then after we'd completed Wii Fit, when we sent the final product to Tsunekazu Ishihara8 of The Pokémon Company, I said to him: "I’m really sorry but you won’t be able to weigh your dogs!" He really enjoyed that one! (laughs) 8 Tsunekazu Ishihara is the producer of the Pokémon series. 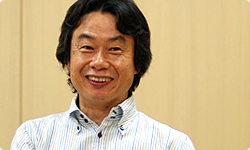 He is currently the President and CEO of The Pokémon Company. Ishihara-san has got two pet dogs, hasn't he? So I did go through a period when I regretted the fact that users couldn’t weigh their dogs. Dogs are the classic pet, after all. On the title screen for the original Wii Fit, all of the Mii characters from the users' family gather together briefly. I thought of this scene as somehow being the Wii "home", so of course it was somewhat sad not to have any pets included. There are many households where pets are seen as members of the family, aren't there? Then once they'd allowed the user to make a decent dog, I said: "Now we should have a cat too!" Well, I had just got a pet cat. There are apparently a fair few people out there who think: "Miyamoto-san always gives dogs preferential treatment. He just doesn't understand the feelings of cat lovers." From now on, I will also be showing consideration for cat lovers. That's why there isn’t just a dog, but also a cat character this time around. You weigh pets by holding them and then weighing yourself, right? At first, the user is asked: "Who is weighing the pet?" Then it will subtract that person's weight and display the pet's weight. There is of course no way that you could get a pet to remain still on the Wii Balance Board, so weighing the user while holding the pet is much more effective. At the same time, it also gives that really nice feeling that the pet is a member of the family. You can well imagine the whole family gathering round to watch the pets getting weighed. Somehow I get the feeling that saying: "We could weigh babies as well!" right after a discussion of dogs and cats might make some people angry! But as it's really enjoyable to watch babies develop, the fact that their weights can be saved will be welcomed by many users. Yes, babies are constantly growing, each and every day. But if all the old data from before they entered kindergarten were to disappear, that would be a real shame. That's why this time we've made it so that you can save ten years' worth of data. 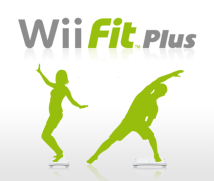 With Wii Fit, you could save three years' worth of data. But this time round, you can see the physical changes you have gone through over a period of ten years. I've always enjoyed guessing the lengths of objects, which is why I carry a measuring tape around with me. Really? That one's new to me too! For instance, I might guess that the table in front of us is about 1.2 metres long. Then I'd actually measure it with the measuring tape to check. If I got it right, I'd think: "I’m on form today!" But if I missed the mark by a long way, I'd think: "I've been slipping a bit recently!" And it's not just length: I also really enjoy predicting the weight and other measurements of things. So for instance, I'd pick up a chair and think: "I wonder how many kilos this weighs." Or I’d wonder how many grams a weekly manga magazine weighs. But for weights, you'd need a set of scales though, wouldn't you? …And we’d each have to bring back something which weighed that much. We'd each put the object on the scales and the person who got closest to their target weight would be the winner! (laughs) Doing something like that would be great fun, wouldn't it? You don't think it would be fun? I thought you could play that kind of game together as a family using the Wii Balance Board. So while it's not precisely the same, there is a somewhat similar game we've included this time round in Wii Fit Plus. Even aside from dogs, I think it's quite a lot of fun to pick up various objects and weigh them.